An accomplished finance professional, Company Secretary with 4 years of significant career track record of innovation and execution integrity. Exceptional communicator with a consultative sales style. Rated as a high achiever by Standard Chartered Bank with accolade letters from senior management throughout the tenure at Standard Chartered and Citibank. 1. To manage corporate & retail clients' portfolio & relationship and be the bank's interface to the client. 2. The role involved direct liaison with major departments of the bank in order to better manage client transactions and therefore involved in-depth understanding of banking products like Treasury, Trade Services, Cash Management Services, etc. 1. Was entrusted with major portfolio on the basis of my performance and was handling the client relationship end to end for the portfolio. 2. Received accolades and appreciation mails from the clients and from teams within the bank. Job Role- 1. To manage corporate relationship & portfolio and be the bank's interface to the client. 2. To develop strong understanding of various products of the bank- Treasury, Trade Services, Cash Management Services, etc to facilitate better client services. The role involved direct liaison with the major departments of the bank in order to manage client transactions 3. Have handled critical processes such as Foreign Currency Transactions (FCY)- both inward and outward remittances of corporate clients, account opening. Achievements- 1. Promoted to Associate Manager in March'11. Was earlier promoted as Senior Officer in 2010. These two promotions were rated as the fastest promotions of the department. 2. Rated "Highest Performer"- Grade 1B for the year 2010-11. Consistent "exceptional performance" in appraisal, in all three performance reviews faced prior to this. 3. Received two awards from MANCO in Aug'11 for implementing two projects, which led to an improvement in TAT and cost saving for the department. 4. Received MANCO award for leading the CSR activity of the bank. 5. 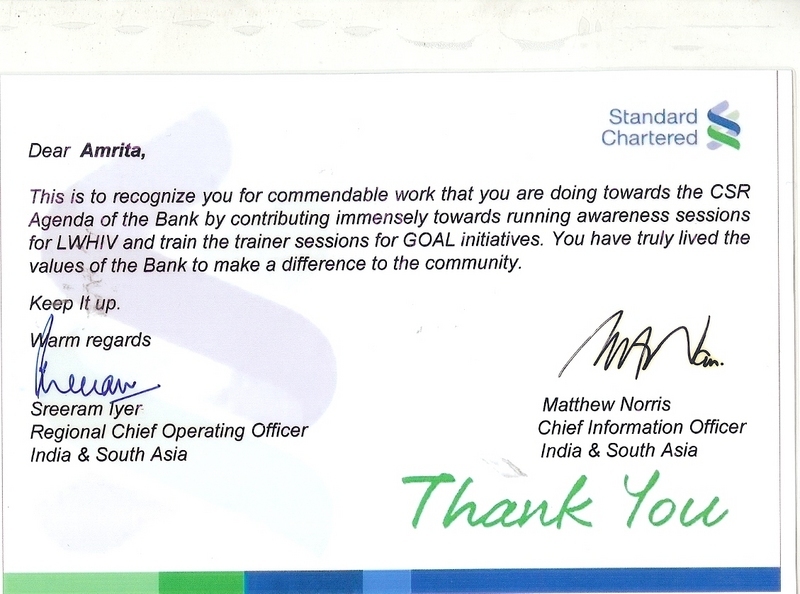 Highly active in the CSR initiative of Standard Chartered Bank- a. Regional Champion of "Lw-HIV"- a bank's initiative to spread awareness on HIV. b. Head co-ordinator of "GOAL- NAZ" program- a bank's initiative to educate girls of the underpriveleged section. 6. Took part in the Standard Chartered Bank's All India Sports Challenge'09 and emerged as the most successful sportsperson with Gold Medal in Chess, Silver in Badminton and Bronze in Table Tennis. 1. Received MANCO award for leading the CSR (Corporate Social Responsibility) activity of Standard Chartered bank. a. Regional Champion of "Lw-HIV"- a bank's initiative to spread awareness on HIV. b. Head co-ordinator of "GOAL- NAZ" program- a bank's initiative to educate girls of the underpriveleged section. 3. At Lady Shri Ram College, led the National Service Scheme and received certificate of appreciation from Dr. Kiran Modi for the same. Selected as National Level Winner in India-France Chamber of Commerce and Industry Competition and was invited by the French Embassy on an all-expense paid study trip of France in 2009. 1. All exams of CS Final cleared in first attempt. 2. Regional topper in CS exams with 43rd All India rank. 3. Successfully completed the 70 hour computer training at NIIT on 'CS- Understanding IT in the Corporate environment', 2009 securing 94% marks. 1. Secured 100% in Economics in Mid Term exams,Term1. 2. Consistent 100% grade in class participation in all subjects graded till date. 1. Holding the post of the 'Lead Banking division' in the Core Committee of the Finance Club, ISB. 2. Selected in the Core Committee of 'Ethics in Business' Forum, ISB. 3. Stood for the post of President, Finance Club. 4. Represented the section in Inter Section Badminton Competition and won all the matches in singles category and reached the semi-finals. Standard Chartered Bank sponsored this 6 month off-the-job diploma in Corporate Banking at prestigious SP Jain Institute, Mumbai for a batch of 40 students selected from the premier undergraduate colleges all over India. 2. 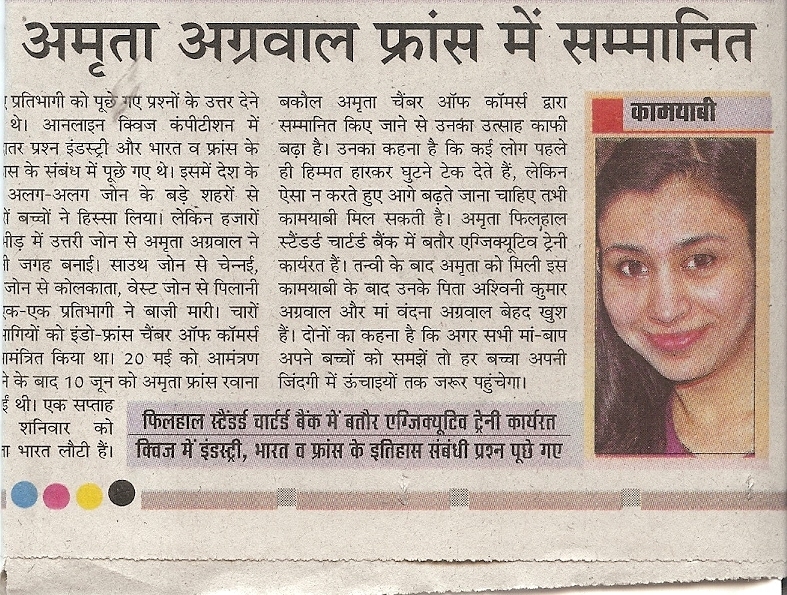 Secured 3rd rank in Commerce department at Lady Shri Ram College. 1. Represented LSR at Comquest 2006- Business Proposal. 2. Received certificate of appreciation from Dr. Kiran Modi for participation in the National Service Scheme. 3. Active debater- Won many awards in debates/ elocution at college level including the second position secured in English Elocution at inter college festival at IT- BHU in 2006. 4. Active member of the Debating Society and 'Expressions' (Literary Society) at LSR. 1. Recipient of Master Jagannath Gold Medal for being the Commerce Stream topper at School. 2. Secured 1st Rank in school in class 12th CBSE Board. 4. Mathematics topper in Class 12th, secured 99%. 1. Recipient of 'Dr. Stya Paul's Moral Values Scholarship' Year 2004-05, presented by Dr. Stya Paul, Chairman, Apeejay Education Society. 2. Successfully co-ordinated School events/ Council Meetings as Secretary, Apeejay School Council. 3. 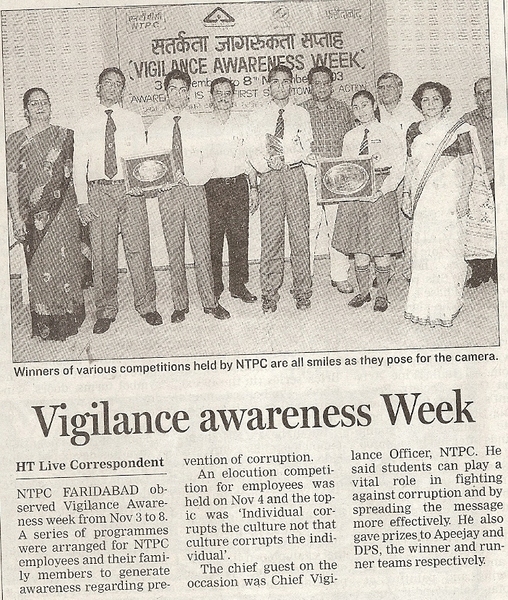 Active debate'er- Won many awards in debate at School level, inlcuding the Best Speaker Award at the prestigious NTPC debate at district level. 4. NATIONAL AWARD WINNER- 2nd prize in All India Essay Writing competition, 2005.